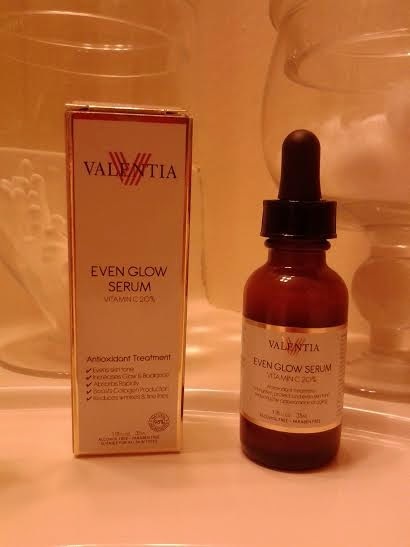 Hi everyone I recently am using this Even Glow serum from Valentia. It has a 20% Vitamin C it is a Antioxidant treatment for your face, neck and decollete. So like I said I been using this one lately and I like it.This was the first time I heard about it so I am glad that I had the chance to use it. I use it most in the mornings because Its when I think my face should be nice and radiant so I can go and do what I have to do. I wash my face and tone it if I need to then, I dab some of the serum around my eyes first then I spread it all over the face. I do see the difference of when I wash my face and then I put this on. My face looks very toned, with a nice glow and radiance. Love that my face does not burn because it has no alcohol and love that its paraben free. I also like that my face feels soft and hydarted and it absorbed very quick. The consistency is just a tad watering but just a tad and it has like a light yellow color. *It states that its a Antioxidant treatment it is alcohol free, paraben free, evens skin tone, increases glow and radiance, absorbs rapidly, boosts collagen, and reduces wrinkles and fine lines. * I received this product free from Valentia Skin Care through the BuView review program in exchange for an honest opinion. I was not required to write a positive review. The opinions I have expressed are my own.